“We have all seen those beautiful shots of a wedding dress hanging in a window or on a door. The photos take us back to that special day, to that memory, and that’s what I wanted to capture in this cake: a memory,” reflects Jennifer Reese. 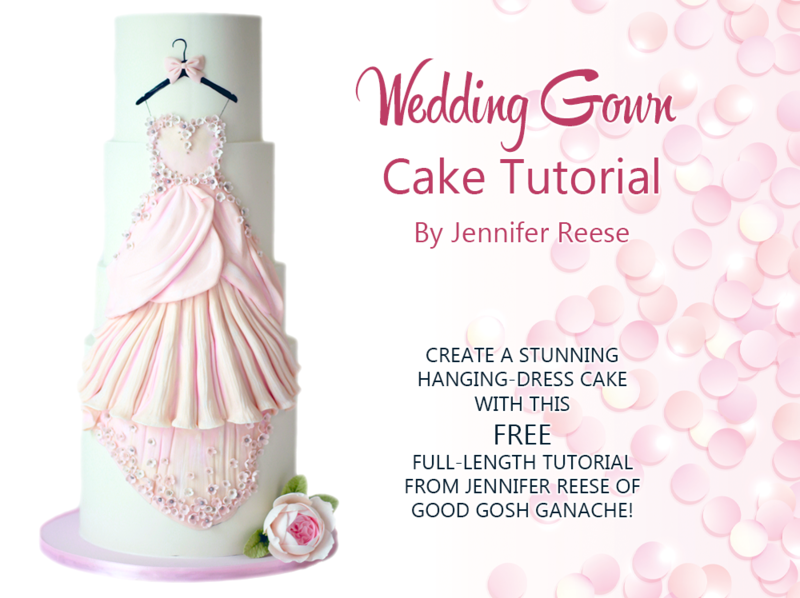 Taking inspiration from a blush Lazaro designer gown, Jennifer captures an iconic bridal moment with her stunning hanging dress gown cake tutorial. In this case, the cake is our canvas. 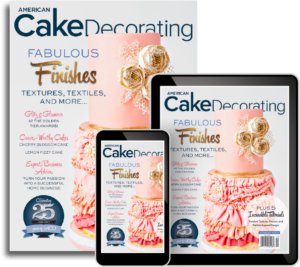 Print out a scaled copy of your chosen dress and lay over a visual drawing of your cake, and determine where your tier sizes will change. 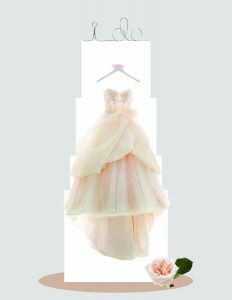 The dress you choose will determine how many tiers you use, their heights, and the difference in diameter from one tier to the next. Jennifer notes: I try to keep the most drastic tier size differences around the waist and lower portions of the skirt where it flares the most. I have provided an illustration demonstrating how I determined my tier sizes as well as a digital sketch of the cake. 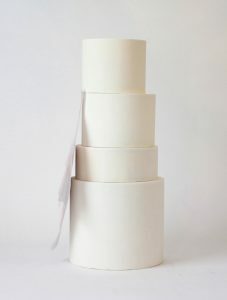 1: Stack and cover the cake tiers. While stacking, I use the scaled printout of the gown as a guide to help me decide where each tier should go. 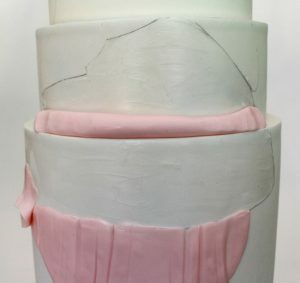 Jennifer notes: Your tiers should be filled, covered in fondant, stacked and supported as they would be with any other cake. 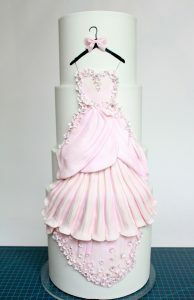 However, one way to create a more dramatic effect with your dress cake is to consider off-center stacking. 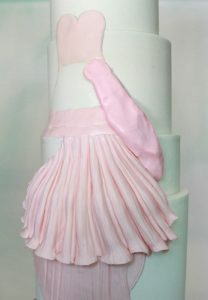 For the tiers that line up with the bodice of the dress, I generally align them vertically at the front of the cake. 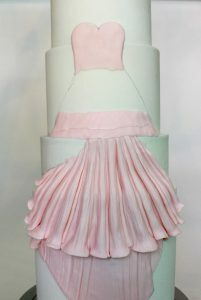 As you move further down the cake, the tiers become more centrally stacked to create the flare of the gown’s skirt. 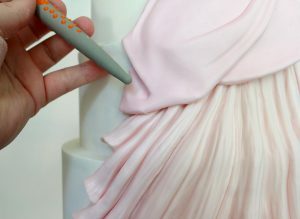 2: Using the printout as a guide, sketch the borders of your gown with a soft-tipped graphite pencil. 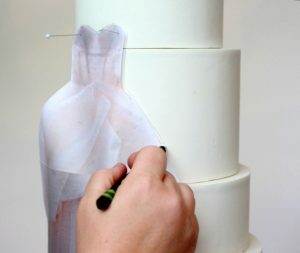 First start with the entire silhouette, then cut out the individual portions of the dress where the fullness of the gown changes drastically, and use those cutouts to create guidelines on the cake. Jennifer notes: Straight pins are useful for holding your template in place while you sketch. 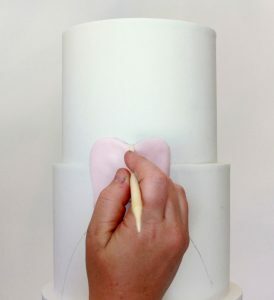 To prepare your cake ready for decoration, fill the gaps between your tiers with royal icing. 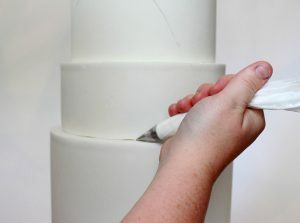 Using a small round piping tip, pipe a thin line of icing all around the base of the tier and smooth using your finger. Jennifer notes: Your final product will be much more beautiful if you pay attention to the small details. As we are working on a white canvas, it’s important to remember that the gaps between the tiers will be much more evident in our final photographs. 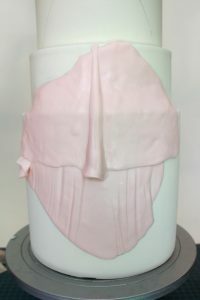 1: Using your template as a guide, cut out sections of the dress using a 50/50 mix of fondant and modeling chocolate, in a blush color. 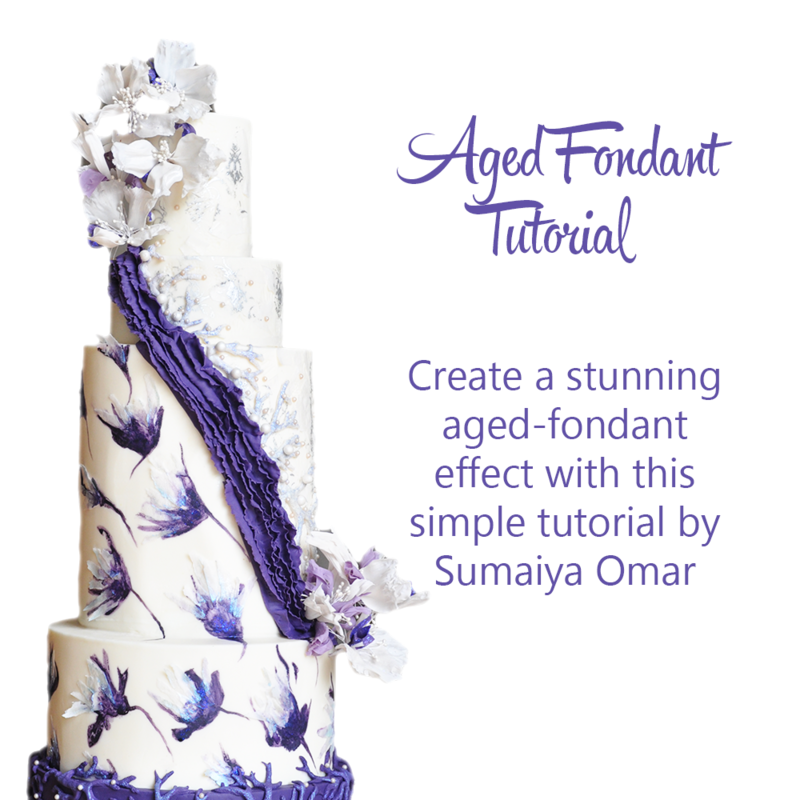 Attach the fondant/modeling chocolate pieces to the cake using shortening. Jennifer notes: Shortening offers versatility because it is much easier to remove the pieces if you need to rework them or reposition them. 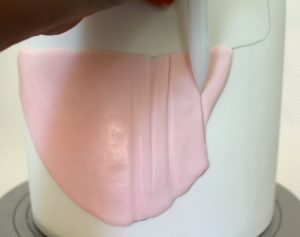 2: Layer the fondant pieces beginning with the area of the cake that is farthest away visually (such as the train and bodice). 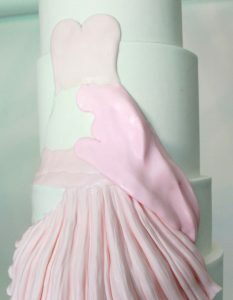 Then gradually add layers toward the areas that are the fullest, such as the bustle and the skirt. Always refer to your template when in doubt. Jennifer notes: To create small details at the neckline or to create boning, a Dresden tool or sugar shaper is my go-to tool. 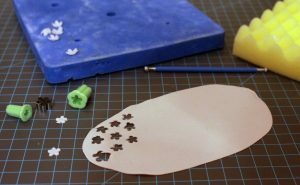 3: To create the train, cut a piece of 50/50 sugar paste using the train template and attach it to the cake with shortening. 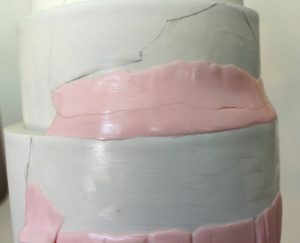 Smooth the cut edges where they meet the cake and then use a variety of tools to create vertical impressions. Jennifer notes: I like using different tools so that my final product is more organic and less uniform. 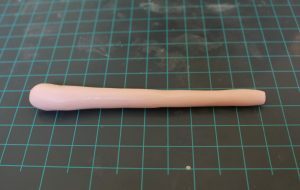 Here, I used a Dresden tool, my pointed sugar shaper, and also a cell pen. Each creates a slightly different-size impression. 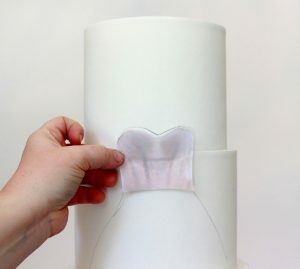 Additionally, I like to smooth the edges of the sugar paste where it meets the fondant on the cake using a sugar shaper. This helps to blend the edges and create a softer look, and it also adds to the illusion that the dress is emerging from the canvas. 4: Be sure to reference your inspiration photo to see where and how the train folds as it hangs. In my inspiration photo, I also saw an area to the left side where there was a large ruffle. I created this by adding another small piece of sugar paste that I folded back and forth onto itself. I attached this with shortening and used my finger to smooth it at the top. 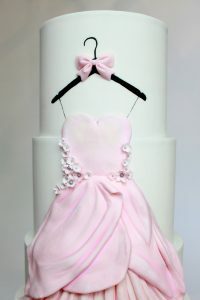 1: Roll a thick rope of fondant that is the same length as the width of the dress. Place it at the base of the upper tier and begin smoothing it out with your fingers to create a nice sloped transition between the tiers. 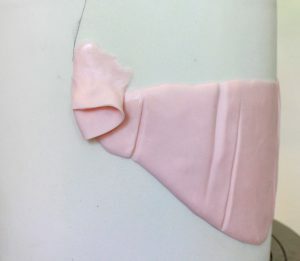 Again, use shortening to attach the sugar paste, and don’t worry too much if it doesn’t look pretty (it’s going to be covered). The most important thing is to stay inside the pencil lines and create the smoothest transitions possible. 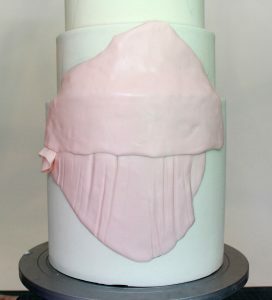 Also, be sure to view the transitions from the side of the cake as well as the front. 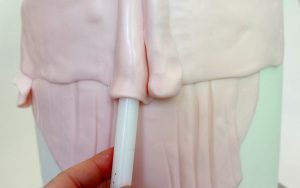 If you need to add another rope of sugar paste and repeat the process, don’t be afraid to do so. 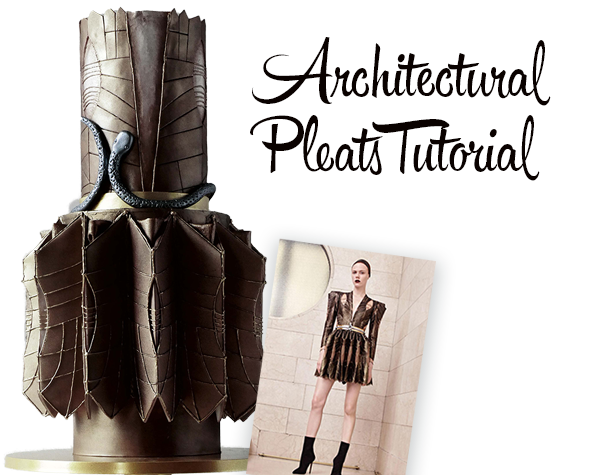 Jennifer notes: The skirt of the dress is where we tend to see the most dimension and texture. This is also the area with the greatest change of visual depth due to the differences in the tier sizes. 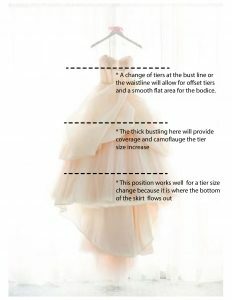 Before we can build this portion of the dress we need to create a smoother transition from one tier to the next. 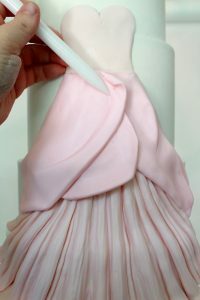 2: Use your next template piece to cut that portion of the dress from sugar paste. 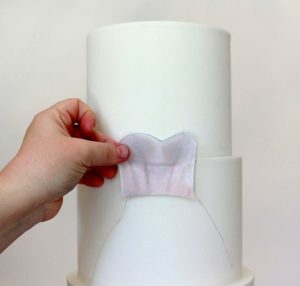 Apply it on the cake over the transition area you just created and smooth with the palm of your hand so that the transition area is no longer visible. 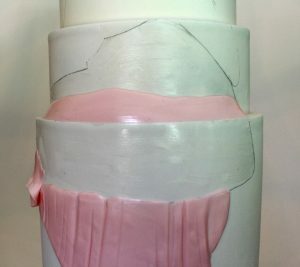 1: To create the dramatic folds of the skirt, we will begin by rolling tapered ropes of sugar paste. These should vary in thickness to create a more realistic look. Attach the ropes to the skirt in a vertical fashion. Some of the ropes can be layered directly next to one another, while others should be spaced farther apart. Jennifer notes: All of this attention to and variation of detail will create a more effective illusion. 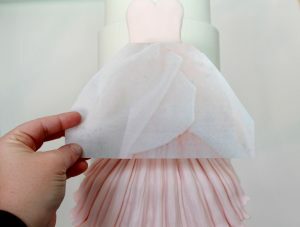 2: Smooth the areas between each fold in the dress with a cell pen or sugar shaper so that they appear to be one piece. Jennifer notes: Pay attention to the undersides of the folds as well. The backside of the cell pen or a ball tool will help with opening the bottom of each fold. 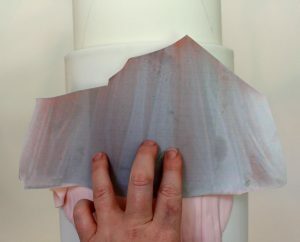 3: Use the thin side of a Dresden tool to give the folds additional texture and dimension as you work. As you approach the sides of the dress, be sure to group the folds closer together and almost stack them on top of each other, as this is how they would gather if they were truly hanging. 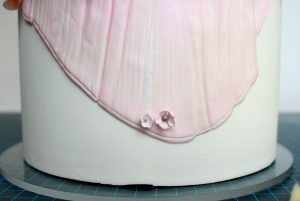 1: For this gown, the shape of the upper portions of the skirt are much different from the bottom folds, so we will mimic those shapes using larger portions of sugar paste. Once again, smooth the transition between your tiers with a rope of paste, and reference your template as a guide. Start with the farthest areas of the gown, in this case, that is the sides. 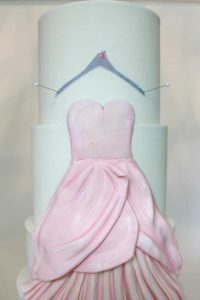 2: Use your template to form a piece of sugar paste approximately the same size and shape that you see on the gown (10C). Apply it with shortening and use your fingers and modeling tools to begin sculpting out the details (10D). 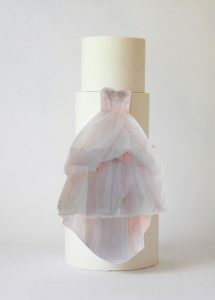 3: Create each subsequent piece of the gown in the same fashion as the previous step. As each piece is added, uses your Dresden tool to clearly define the areas where the pieces overlap, as this will help maintain depth in the final product. Jennifer notes: My sugar shapers and cell pen worked beautifully for creating additional details. 1: Now that the shape of the dress is complete we can add some additional visual interest through the use of color. 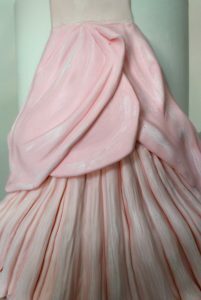 White gel color is great for painting highlights on the raised portions of the dress folds. For the inner portions of the fold, I used a light wash of color made with a mixture of Everclear and petal dust. Jennifer notes: Don’t go overboard with your color, just some subtle highlights and lowlights can make a big impact. 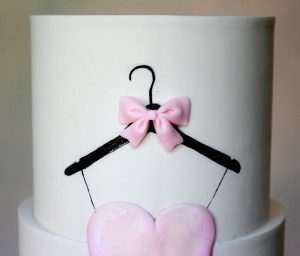 2: Using your photo template, cut out the hanger and attach it to the cake with straight pins (12A). Then trace the hanger with a pencil and remove the template. 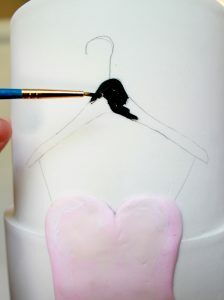 Paint in the hanger with black gel color or a black edible food marker (12B). Jennifer notes: For fine details like the notches in the hanger, I simply scraped away the color in that area with an X-Acto blade. Be sure to use a thin detailing brush when painting small details like these, as it will give you more control and a cleaner final image. 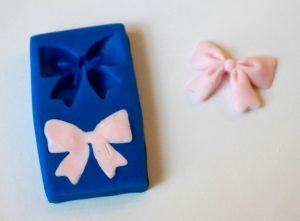 3: To finish off the hanger, I molded a bow from the same 50/50 sugar paste mix we used on the dress. 1: No fantasy gown would be complete without some stunning floral details, so here is where we will deviate from our inspiration photo to make the gown our own. For my gown, I used the smallest five petal cutters I have to make some easy flower appliques. 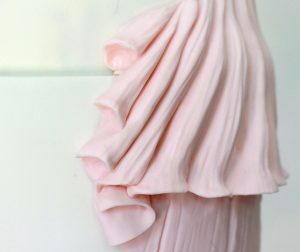 Create ombré shades of blush by adding varying amounts of white to the blush-colored paste we used for the dress. 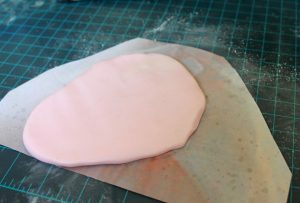 Add a small amount of tylose to the paste so that it dries quickly and holds its shape well. Roll the paste very thin (I rolled to a number 5 on my kitchen aid pasta roller) and cut varying sizes of flowers from each shade of paste. 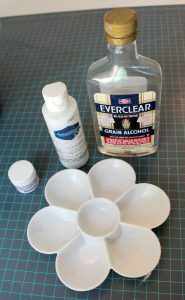 2: Use your ball tool to thin the edges of the petals and cup the center of the flower inward on a piece of craft foam. 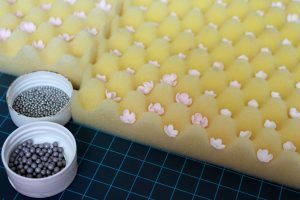 Allow the flowers to dry in egg crate foam or small flower formers. 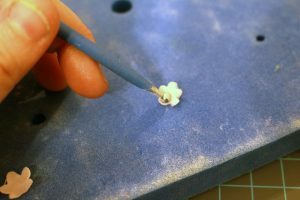 3: Once dry, apply a small dot of piping gel to the center of each flower with a paintbrush and drop in a sugar pearl. 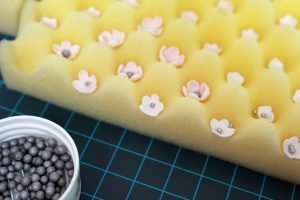 Jennifer notes: I recommend dropping in the pearls while the flowers are in the formers/foam so that they fall easily in place. 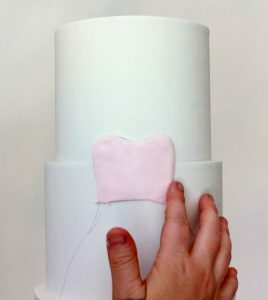 4: Begin applying your flowers to the cake using the amount of piping gel. 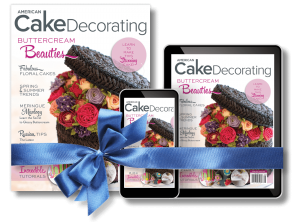 If you are using larger flowers or heavier elements, you may need to consider using royal icing or chocolate to secure those pieces to the cake. 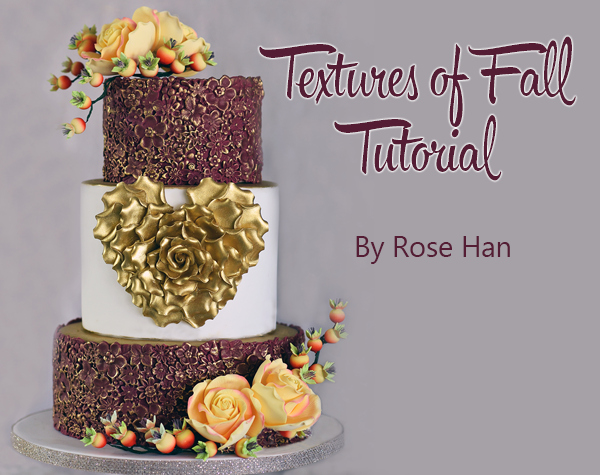 Use the floral elements to help define the shape of the gown in some areas, such as the bodice, and to add texture and visual interest in other areas, such as the train or the bustling. For my gown, I also decided to add a thin impression along the bottom of the train to represent the hemline. 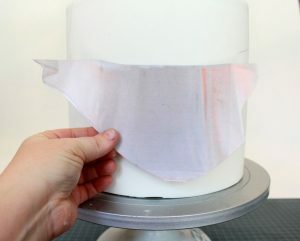 Jennifer notes: As an optional detail, add some lose sugar pearl or nonpareil details. Jennifer Reese has a background in design, with a Bachelor’s in Environmental Design from Texas A&M University. She attended the culinary school at the Culinary Institute Le Notre in Houston, Texas, graduating with an Elite Diploma de Patisserie. Jennifer has received several ribbons at both OSSAS and That Takes the Cake, with her most recent accolade being Best of Individual Tiered Showcakes at That Takes the Cake 2017 (the dress cake). 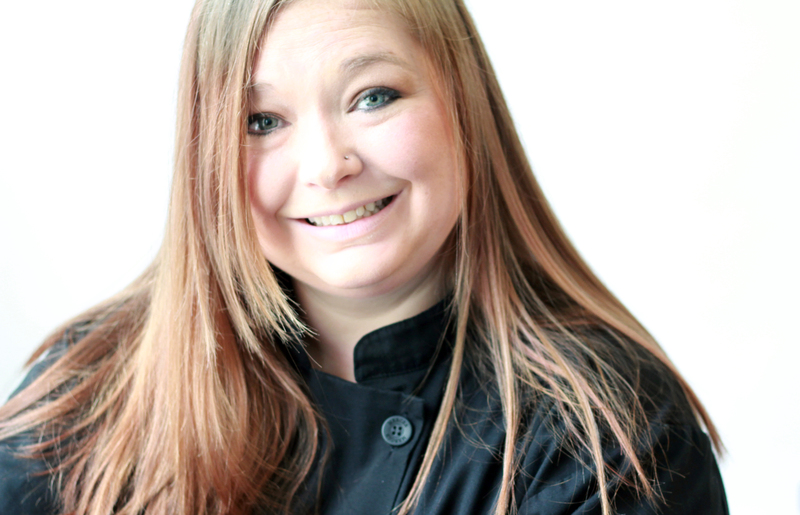 Jennifer started Good Gosh Ganache in 2014, and she loves to create and push the boundaries of what she thinks is possible in cake. “I have a passion for design and art in all its forms. Sugar is my medium and cake is my canvas,” she notes.